This is the Russell Engineering developed RE13OT for optimum street performance use where sports-torque is the main aim. Slightly lumpy idle, pulls hard from 2,000rpm to 6.000rpm in large-bore based engines. Performance is in the Piper 285/Kent286 sort of area but out-performs both for torque. Best performance given with 1.4:1 ratio rockers and a cylinder head with efficient port work, but also gives better than can be expected performance with a mediocre cylinder head with standard rockers. All cams have A+-type slot drive for oil pump. Never use used cam followers unless it is on the cam they came from and where position numbered. 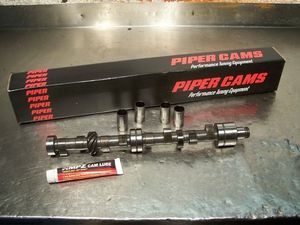 Now ground on brand new cross-drilled cam blanks, kit contains RE13OT cam, quality followers, cam lube, valve springs and cam installation instructions.